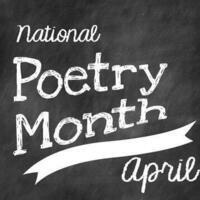 Celebrate National Poetry Month this April by participating in the many events planned at Westshore Campus! Wordsmith your own poems using the supplies available on this interactive display outside the Student Engagement Office. Wednesday, April 11, 6 p.m. Attend this reception celebrating student accomplishment and hear from Associate Dean of Learning and Engagement, Dr. Claire McMahon as she reads a poem about accomplishment and celebration. Wednesday, April 18, 1 p.m. Hosted by poet Ray McNiece. McNiece has earned a national reputation as a poet and performer through his solo theater pieces and his captaining of 2 National Poetry Slam Championship teams! Ray is the author of six poetry books, a graduate of the Ohio University’s Honors Tutorial College, and currently teaches English at John Carroll University. Students will have the opportunity to spontaneously compose haikus and compete for the best poem and performance! Monday, April 23, 11 a.m. – 2 p.m.
Stop by the rotunda and “drop a line” as we create a collaborative poem throughout the day! Monday, April 30, 2-3:30 p.m.
Join Assistant Professor of English, Bridget Kriner, and Associate Dean of Learning and Engagement, Dr. Claire McMahon, as they host a workshop to assist budding writers in developing and finalizing personal poetry. Bring your poems or come ready to begin a new piece! Dessert will be served.